A photograph of Robert (Bob) Dawson Lykins in his grocery store located at 526 North 2nd in Atchison, Kansas. In 1938, he started working at Arnsberg's grocery store located at 10th and Main in Atchison, Kansas. 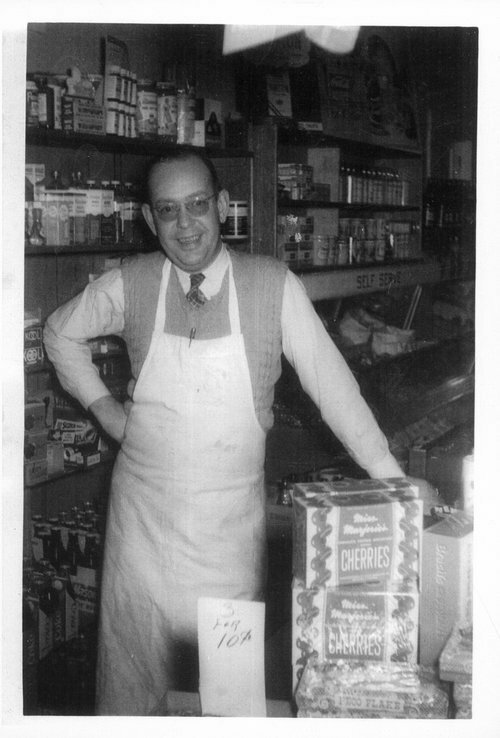 In 1945, Lykins became the manager of Arensberg's store at 9th and Parallel. Three years later in 1948, he went into business for himself opening the store at 526 North 2nd. Lykins worked hard keeping the store open from 8 am to 10 pm each day for the first 15 years. He closed the business in 1975 after it became economically difficult to compete with larger stores. In addition to owning and operating a grocery store, he served as an Atchison County commissioner.